All these days, I was wondering why Auroville folks are keeping a complicated process for going inside Matrimandir- why not let the regular day visitors take a quick look inside. But after my visit to the inner chamber, I appreciate the separate process defined for this purpose. 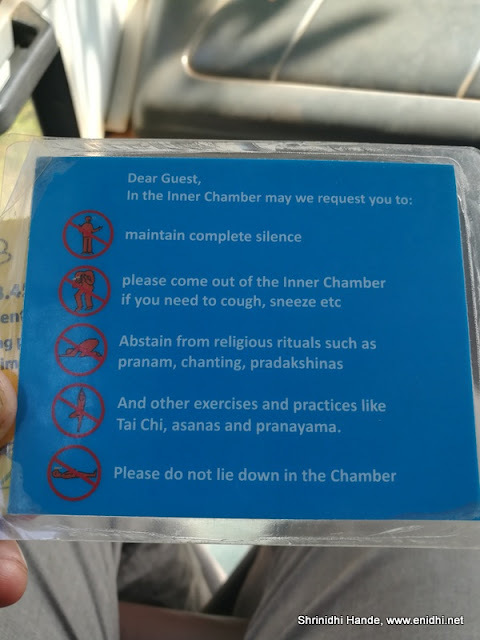 Read this earlier post to find out about theprocess involved to get entry pass for Auroville’s Matrimandir inner chamber. After collecting our passes, on the designated day, we reached Visitor Information centre in Auroville at about 8.35 AM, 10 minutes to spare for the designated start time. We were guided to a video room-approximately 150-200 people had gathered there for that day’s visit. Doors were closed promptly at 8.45 AM- I saw only 1 person allowed in 2 minutes after the video started. A 16 minute video was shown to us, explaining Auroville’s history, objectives, the progress over the year and so on. After watching the video, we went out in a queue, were given a blue pass and were taken in bus to Matrimandir. Once near Matrimandir, we were asked to deposit our bags and cell phones. We did so, collected the token and waited under shade for everyone else in the group to deposit their stuff. Next we were allowed into the garden that houses Matrimandir, a 100 meter walk and were asked to wait again. Here a volunteer explained further on the garden, the matrimandir and answered questions. We were told there’s another group inside and we’ve to wait. I am guessing there are different timing for repeat visitors, residents etc. Also I realized our group size had shrunk from 150-200 as it was in video room- I guess while being transported from visitor centre to Matrimandir the large group is split into 2-3 smaller groups. There's a computer controlled light capturing device on the top, which rotates in the direction of sun, captures and sends sun ray down into the matrimandir where a glass sphere is placed to receive and propagate this further down to the sphere located at lotus pond. Matrimandir was built by volunteers, under guidance from expert architects. Each garden block around Matrimandir was given a theme and flowers are to resemble this theme. Next we were led to the base of Matrimandir- here we mediated for a few minutes- infront of a glass sphere that receives the sunlight from the top, surrounded by petal shaped marble tiles- this spot was called lotus pond, situated exactly below the matrimandir sphere. From here, we walked inside the Matrimandir. At this point, we were given fresh white socks to wear. With these on, we proceeded to climb up to the inner chamber, through a spherical flat staircase. The inner chamber is a 12 cornered room with 12 tall pillars. At the centre a ray of sunlight is directed downwards on a glass sphere, which propagates it further down. In this chamber visitos can mediatate for 15 minutes- which cushions are provided for comfort. We were told second time visitors will get longer duration- like 30 minutes. After meditating for 15 minutes we came out through another path, returned the white socks, came out. We were told a bit about the large Amphitheatre that can house 5000 people and the big banyan tree that is at the centre of Auroville. We came to Visitor information centre by about 11.20 AM. Official history of Matrimandir is here on Auroville website. Yes. I don’t regret the time and effort I had to spend in getting the pass and to go inside the inner chamber. It was a good experience. Unfortunately no photographs for you- not allowed inside. Why a separate n complicated process to visit inner chamber of Matrimandir? The space inside the inner chamber is limited. It can’t accommodate large crowds. I think 50-60 is its capacity (if everyone has to sit and meditate) at a time. Besides granting an entry, it is also important to sensitize visitos about the concept behind Matrimandir, the need to maintain silence etc. This is best done in smaller groups. Generic visitors who are only allowed to see Matrimandir from outside develop a curiosity as to what is inside. A small percentage of them make an attempt to come back, get the pass to go inside the inner chamber. Thus the first visit is largely to quench curiosity as to what’s inside Matrimandir. For serious meditation, one has to plan subsequent visits. What else can you do after visiting Matrimandir? You can visit Solitude Farm which is about a km from Matrimandir exit gate- here you can learn about farming, buy some farm produce, have breakfast/lunch etc. Do standby for my detailed post. Great to know about Matrimandir, Very useful informations. Oh, I didn't know it was not easy to get into the Matrimandir. That's quite a good idea to keep the sanctity of the place, intact. Good post. Good effort to understand why a specific process to visit Matrimandir. Point 3 comes closest to the truth. At the root of the planned and guided first visit to Matrimandir lies the following words of the visionary of Matrimandir the Mother. "And then, people will not come for a regular meditation or anything of that kind (but the inner organisation will be made afterwards): it will be a place for concentration. Not everyone will be able to come; there will be a time in the week or a time in the day (I don’t know) when visitors will be allowed to come, but anyway, no mixture. A fixed time or a fixed day for showing people around, and the rest of time only for those who are… serious—serious, sincere, who want to learn to concentrate."